They Tweet, they create YouTube videos, and now students can even check-in to the office on Foursquare when seeking career advice. But this extensive use of social media is just one of the many services offered at the Toppel Career Center, which is topping the charts. Toppel, UM’s on-campus resource that prepares students for professional success, was ranked as one of the top career centers in the nation in 2011. This high ranking was based on an annual survey conducted by Universum, a market research firm. The center competed against similar institutions at 20 private universities, including Duke, Cornell and Northwestern. More than 4,000 students from these institutions were asked to rate the different services provided by their university’s career center. Out of the nine different measures that the survey took into account, the Toppel Career Center scored above average on eight of them. These advising sessions are broken into career clusters such as sciences or media and entertainment, in order to cater to student needs, Garcia said. Advisers’ guidance is not only limited to careers and internships, but it also covers selecting a major and preparing for graduate school. Other measures in which Toppel excelled include its assistance in teaching students how to network and gain experience, as well as its numerous workshops which feature panelists who specialize in a particular line of work. The career center is also active on seven different social media platforms. The campus resource also keeps alumni involved when assisting with job searches. 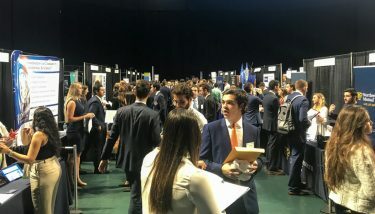 “We launched the Canes Career Club which is open to alumni and students ready to graduate to come and talk in a low-pressure setting to share ideas, tips and resources about the job search,” Garcia said. The introduction of these new services has increased the amount of undergraduate students who take advantage of the career center from 49 to 61 percent in the last year. “Toppel’s availability – where you can walk in at any time – and also how they are constantly doing workshops definitely increases the hiring rate,” said senior Marlo Wyant, a Toppel peer adviser. Toppel’s website, HireACane.com, also features information on topics such as creating a resume or searching for internships.